The term "staycation" has become part of our vocabulary. It references the fact that we have so many wonderful resorts right in town -- after all, this is a tourist destination area -- that we really don't have to get on a train, a plane or take a long road trip in the car to relax and have some fun. We can vacation in our own backyard. When we do that, we might want to take our beloved pets along with us. 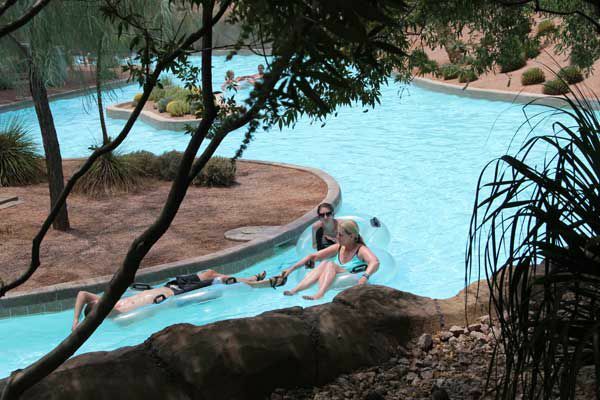 Westin Kierland Resort & Spa is one of our local Scottsdale resorts where you can play, relax, swim, eat and bring the family pet. I spent one day and one night at the resort with my spouse and our dog. I wish I could have stayed a week! After checking in we wandered around the expansive grounds. We noted a myriad of scheduled activities. For adults, there are cooking demonstrations, fitness classes, mixology workshops at the bar -- muddles are the specialty here. For kids, there are pool activities, parties, day camps and a Digital Kids'Club. The OK Corral is near the pool and has lawn chess, basketball, game tables, and RC Car Race Tracks. The fire pit is the place to be for “Kierland Kampfires” and Arizona S’mores. There are two pools here: the Adventure Water Park includes the lazy river ride and a 110-foot-long waterslide. The Aguamiel pool features lap lanes for fitness swimming, hot tub and private cabanas. It is open 24/7 and is designated for adults only. Agave, the Arizona Spa is highly acclaimed, with 20 treatment rooms, a full-service salon, movement studio, weight training and cardio studio. Locals can and do take advantage of these services even when they aren't staying at the resort. Every evening, Master Bagpiper Michael McClanathan plays the Scottish Pipes at sunset to pay tribute to the contributions made by the Scottish immigrants to Arizona's history. He is very friendly and talks to guests of all ages. There may be additional live musical entertainment following his performance. Check the resort schedule. There is no charge for this entertainment. About the food. I am somewhat of a regular at Kierland's premier dining spot, deseo, serving Nuevo Latino cuisine. I have also been to Nellie Cashman's for brunch in the past. The only place I had never tried at Westin Kierland is the Brittlebrush Bar & Grill, so we ate on the patio, accompanied by the dog. The weekend brunch menu is delightful, with American favorites as well as more unusual Scottish selections, in keeping with the resort theme. The brunch menu includes both breakfast and lunch items. We were there early, so we tried the Short Rib Hash (braised short ribs, sweet potato and chayote squash, served with poached eggs and sage hollandaise) and the Baked Ham and Eggs (black forest ham, mushrooms, gruyere cheese and baked eggs) along with a side order of griddle cornbread with agave butter. Now, that's the way to start a day out right! After breakfast, we were able to squeeze in 9 holes of golf before our checkout time. Kierland has a golf course that I highly recommend with 27 holes. In the summer, this is the place to play -- the driving range is shaded and the golf carts have adjustable cooling systems in them! Even though it was 100 degrees, these carts made the experience a breeze (literally). Locals can make tee times here, too. In the winter, a round at Kierland might cost you over $200, but in the summer rates are greatly reduced. We took our dog for a short "staycation" at the Westin Kierland Resort & Spa. My dog's name is Poco; she is a Basenji. The Westin Kierland Resort has specific rooms set aside for those guests bringing pets to the resort. You should contact the resort in advance to make sure they know that your dog or cat will be staying with you. As is common in the industry, there are specific rooms here that are used for pet stays. The Westin Kierland is very considerate of pets and their owners, providing rooms that are on the lower level and have easy access to grassy areas. I was actually able to walk outside my patio door right to the grass. Interior exit doors were also convenient, when I needed to lock up the room and go out with Poco (you can't lock the patio doors from the outside). This is a large, beautiful resort with many grassy areas where Poco could walk and sniff and otherwise do what dogs do. Poco was able to accompany us on a walk around the grounds. Naturally, she wasn't allowed inside any of the restaurants or in the pool areas. She did sit outside with us at Dreamweaver's Canyon, where we listened to Master Bagpiper Michael McClanathan. Poco had never heard bagpipes before, and it seems to me she'd be fine never hearing them again! In the morning, we had a lovely breakfast on the patio at the Brittlebrush Bar and Grill, overlooking the golf course and driving range. There was plenty of shade there and Poco came with us. My stay at Westin Kierland was during the summer; sidewalks here can get too hot for unprotected paws. When taking your dog for a walk anywhere in the desert during the summer, try to do it in the early morning or after sunset. Here are some other things you should take into account about dogs in the desert heat. I noticed that at about 9:30 p.m., well after the sun had gone down, there were quite a few people out walking their dogs around the property. That's the way to do it. The resort staff was noticeably pleasant about Poco wherever we went. She attracted a lot of attention from guests and staff alike, and I know she enjoyed that! You'll have to sign a waiver upon check-in to reimburse the resort for any damage caused by your pet during your stay. There is no required deposit (June 2012). There is no weight or size limit here for your pet. There are no pet sitting or specific pet services provided at this resort. They do provide a special pet bed and pet bowls for water and food in your room. They don't provide treats for your pet. If you leave your pet in the room while you are out, you must crate the pet. There are lots of outdoor common areas where you can take your pet at this resort. Guests bringing pets are assigned rooms on the lower level, with easy access to grassy areas, on a space available basis. Of course, you are expected to clean up after your pet. Biodegradable bags are provided upon check-in and there are a couple of stations on the grounds where you can get more and deposit used bags. Your pet is not permitted in the pool areas or in the restaurants. If the restaurant has an outdoor patio, your pet may accompany you while you eat there. Of course, pets must be leashed at all times when outside of your room. The Westin Kierland Resort & Spa is located in North Scottsdale.